Vertical Frontiers is run by experienced IFMGA Mountain Guide Ben Bradford. 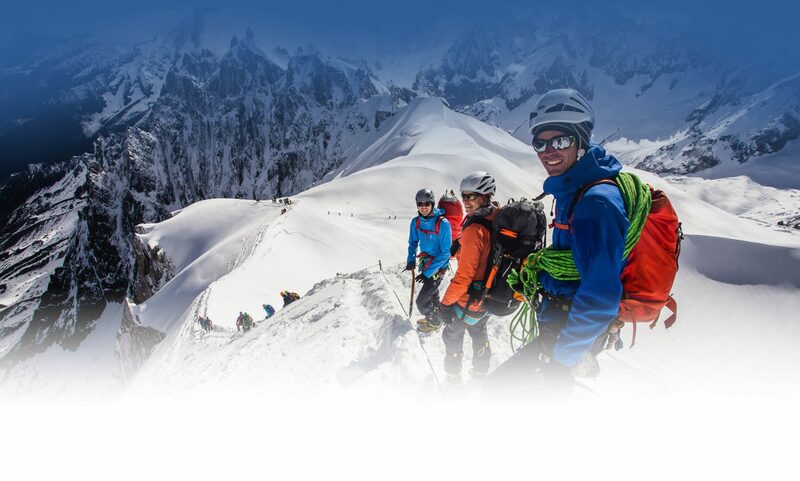 We are a team of Chamonix Mountain Guides & Ski Guides offering friendly, professional courses throughout the UK and Europe. Rock Climbing, Alpine Mountaineering and Skiing is our passion, both at work and pleasure. Our Alpine base is Chamonix Mont Blanc, one of the most famous and popular mountaineering destinations in the world. Chamonix is also close to many other Alpine centres, and we travel to Grindalwald for the Eiger, Zermatt for the Matterhorn and other valleys in Switzerland for our Alpine Mountaineering course. Our UK base on Dartmoor in Devon gives us access to some of the most picturesque and spectacular rock climbing in the UK. We run courses and trips here year round. In the winter we offer Off Piste skiing and Ski Touring trips, within the Chamonix valley and nearby resorts such as Courmayeur, Verbier, Saint Gervais and Megeve. We try to be as flexible as possible taking our clients to the best snow and venue for them and the conditions. Chamonix is also home to the famous off piste run, the Vallee Blanche. We run many private trips as well as open courses for individuals wanting to join a group. On Dartmoor, Devon and Chamonix, France our instructors and guides are qualified to a high standard and have extensive experience with a wide range of groups and abilities. With over fifteen years of experience in the outdoor industry both in the UK, Europe and on world-wide expeditions. We run many private trips as well as open courses for individuals wanting to join a group. Check the news page to keep up to date with our blog. I would like to thank Ben for some excellent ski guiding earlier this year. We booked several days off piste skiing, with the highlight being the Vallee Blanche, for my son's birthday. An excellent couple of days, learnt loads of stuff, and felt much more confident about my skiing afterwards. Ben is super nice, very competent and we will definitely book some more guiding in the future! Thanks Ben for an excellent 4 days of skills training. We thoroughly enjoyed progressing through our alpine skills, from being led to leading! We learned loads and now feel we have a good base to build on. Thanks also for all your additional guidance - from good places to eat to what to do when we finished our course and routes to look to in the future. We had a great time and wouldn't hesitate to use Vertical Frontiers again! Spent a fabulous 3 days doing skills training and some guided routes in the Alps under Ben's excellent tutorage. He is a fantastic guide I trusted instantly and cannot praise enough, highly recommended. Last day culminated in bagging the classic the Cosmiques Arête, which only cemented my desire to return! I did two weekend trad courses with Matt on Dartmoor. First time I wasn't fortunate enough to equip myself and use the skills I learnt but still had a fantastic weekend an enjoyed every aspect. Super friendly, helpful and calm instruction! I've used Vertical Frontiers a number of times now for skiing and alpine climbing. Ben and all the guides he works with work hard to deliver the best experiences; balancing achieving goals, some adventure whilst respecting the weather and conditions. Epic Mont Blanc summit from the Italian side in July, superb. Bens bants are half decent too. Ben and his Vertical Frontiers guides have taken me from a summit-less newbie to accomplishing the Matterhorn. Over three summers he has shown me some beautifully quite and tucked away summits in L'Eveque and Pigne d'Arolla, guided me to the summit of Mont Blanc despite unplanned disruptions to our plans and most recently four 4,000+ summits over five days, culminating with the Matterhorn. Ben is highly dependable, conscious of your skill level and capable of planning expeditions that pushes you just enough to challenge and develop your capabilities. I cannot recommend him more highly and count down the days to getting out on another expedition with Vertical Frontiers.